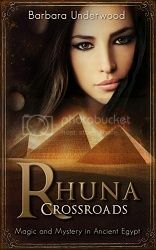 The sequel to Rhuna, Keeper of Wisdom, and the second book in an exciting and unique historical Fantasy series, Rhuna: Crossroads is set in exotic Ancient Egypt and features unforgettable characters and a riveting adventure. Some years have passed since Rhuna helped to defeat the Dark Master in her new home of Atlán, and now Rhuna has a teenage daughter who accompanies her on an assignment in Ancient Egypt to investigate some disturbing reports. She soon discovers an astonishing underground network of the Dark Master's followers, along with the secret group of Atlans dedicated to stopping them. In the process of trying to carry out her assignment, Rhuna is confronted with enormous challenges which could drastically change her entire life and everything she has ever believed in! Underwood returns to her fantasy world with the same vibrant and inviting writing style that I loved in the first novel. The change in locale allows for even more enticing world building, drawing me deep into the mystery that Underwood develops in the beautiful locations that she transports readers to. 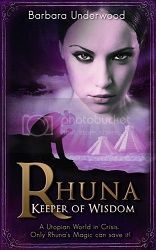 The seamless plot kept me hooked throughout as Rhuna battles through the challenges before her. I loved meeting the new characters that Underwood presented here, but also fell deeper in love with those who returned from the 1st novel. The continuous character development made everyone seem so real. The way that their thinking changes, even if minutely, through the events that they face was fantastic. Once again Underwood has created a novel that I couldn't put down. It was a one of a kind experience that I wouldn't hesitate to recommend to others. That said, for the full experience I would also suggest reading the entire series in order. Sounds like a great book but also a series that you would have to read from the start to completely understand. I hope I win and will buy your book.